Fantastic and friendly staff! The rooms were so clean, new and had a great comfortable feel to them. An excellent facility. 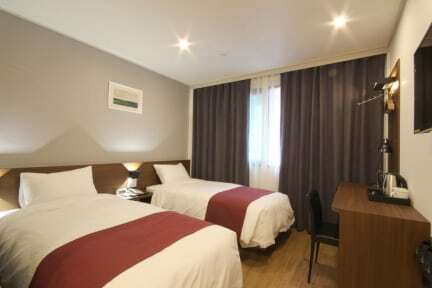 The private rooms are more like those at a high-end boutique hotel than those at most hostels. Highly recommend. Excellent place. Actually it’s the best place we’ve stayed so far. Positives + friendly and helpful staff with good English +everywhere is extremely clean + quiet + nonsmoking + excellent wifi + newly decorated. All furnitures are in great condition. + nice breakfast +good location, many restaurants, train st and beach are nearby Negatives - none! This place was amazing. 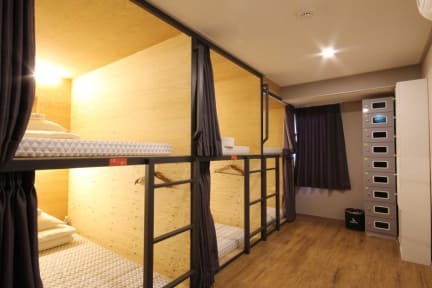 Right close to haeundae beach, staff gave awesome recommendations, very clean and well maintained (they even do turn down service! ), the free breakfast is nice and they have luggage storage. Will definitely stay again! This place was great! Everything was clean and the price and location were perfect. The staff members were helpful and friendly. I do wish there had been more interactions with other guests but overall we had a great time. Room was great and super clean. Staff very helpful. We stayed at a private room and loved it except for one thing- all the electricity in the room is powered by the room key, which means you can't leave the room and leave something like a laptop or extra phone battery to charge. Will definitely recommend for others. More of a hotel then a hostel. Common area was dead each time we went, so there really isn't much of an "atmosphere", although that could be time of year. Great facility right near the beach.